Updated Wednesday June 20, 2018 by Spokane Valley Girls Softball Association. 1. The Executive Board and Division Commissioners shall interpret, enforce and abide by the Constitution, Bylaws, rules, and regulations of the SVGSA. 2. Any violation of the following rules will be subject to a disciplinary hearing. 3. Current Amateur Softball Association (ASA) “Fastpitch” rules govern all games with all of the following deviations. This is an open program for all girls according to Article II, Section I and 2 of the Constitution of the SVGSA. Players are placed into the following divisions according to their age. 6U -Players who will be at least five years old, and who will not yet be seven years old through the end of season play. Four-year-olds may play with approval of the board. 8U -Players who will be at least seven years old, and who will not yet be nine years old through the end of season play. 10U-Players who will be at least nine years old, and who will not yet be eleven years old through the end of tournament play. 12U-Players who will be at least eleven years old, and who will not yet be thirteen years old through the end of tournament play. 14U-Players who will be at least thirteen years old, and who will not yet be fifteen years old through the end of tournament play. 18U-Players who will be at least fifteen years old by the beginning of play, and who must be eighteen through the end of tournament play. Every player shall register on-line. Payment will be made by on-line service, mail, or hand-delivery to SVGSA. Registration must be completed and payment made before a player is eligible to be rostered to a team. 1. Coaches are not to collect, mail, or turn-in registrations for their players unless otherwise instructed by the SVGSA Board. 2. A copy of each player’s birth certificate or legal verification of date of birth must accompany registrations and remain on file with the SVGSA. 3. No registrations will be accepted after the registration cut-off date. If a team count falls below the minimum player count, we will accept registrations up to minimums as laid out in Article 2, Sec. 5. 1. Team rostering will be executed by the Rostering Committee. 3. Special rostering requests from a parent will be considered and ruled upon by the Rostering Committee. 4. No new teams will be formed after the Spring Coaches Meeting. 5. Decisions by the rostering committee are final. 1. All divisions shall consist of teams having a minimum of 11 and a maximum of 14 girls. 2. Exceptions to team size may be made with the approval of the Executive Board on a case by case basis. 1. No 10U, 12U, 14U, or 18U coach or team representative shall contact any player in any school geographic location with the intent of soliciting the player to participate on any one particular team. 3. If any of the preceding rules are violated, charges will be brought before the Disciplinary Hearing Board. 1. All teams, except those designated by the Board, will be involved in an end-of-season tournament to decide the champions of each division. a. The team with the better record from games played between the tied teams during the regular season. b. Runs allowed. Team with fewest runs allow during the regular season. c. Coin flip if a) and b) don’t apply. 1. A person may coach only one team unless approved by the Executive Board. 2. Coaches are financially responsible for all league equipment assigned to them. a. All equipment must be returned on each division’s designated date at the end of the season. b. A $100 deposit will be required from all coaches before receiving equipment. Said moneys will be returned after equipment has been returned. c. If equipment is not returned by end of tournament the $100 deposit will be cashed. a. Their team’s conduct before, during and after each game. b. Their team’s promptness at the game site. c. Acquainting their team with these Bylaws and all ASA rules which affect players in the SVGSA. d. Turning in score report form to the Snack Shack immediately following the game. e. Failure to do any of the aforementioned will result in forfeiture of the game. 4. Anyone under the age of 21 may not be a head coach, except by approval of the Executive Board. 5. There may be no more than three coaches in the dugout or on the bench during a league or tournament game. 6. Anyone under the age of 18 who is coaching bases must wear an official batting helmet. 7. Washington State Patrol background checks are mandatory for all coaches. 8. At least two adults must attend every practice and or team event. 9. SVGSA reserves the right to determine, on an ongoing basis, the eligibility of any individual to coach. 10. SVGSA reserves the right to remove any individual from a coaching position based upon a determination of eligibility. 1. Regulation shirts issued by the SVGSA must be worn during all league and tournament games by all players and head coaches. 2. Shirts must be tucked in at all times. 3. No jewelry of any sort (e.g. necklaces, rings, watches, earrings, etc.) may be worn during games. a. Exceptions will be made for items required to be worn by religious faith, but such items must be secured in such a manner as to prevent hazard to the player wearing them and to other players. b. Exceptions will be made for medical items (e.g. medic-alert items), but such items must be readable and secured in such a manner as to prevent hazard to the player wearing them and to other players. 2. Long pants - 10U, 12U, 14U, and 18U. 3. Any equipment issued by the league must be worn. 5. Anyone under the age of 18 warming up the pitcher must wear a catcher’s mask. 6. All players must wear regulation shirts issued by SVGSA for the current year. 7. All bats not distributed by SVGSA must meet applicable ASA parameters. 8. All batting helmets for 8U and up shall be equipped with a NOCSAE approved face mask/guard as per ASA regulations. I will remember that my child is involved in organized sports for her enjoyment, not mine. I will encourage good sportsmanship by demonstrating positive support for all players, coaches, and officials at every game, practice- or other SVGSA event. I will not publicly question an officials’ judgment, and never their honesty. I will demand a sports environment for my child that is free from drugs, tobacco and alcohol and will refrain from their use at all SVGSA events. I will do my very best to make SVGSA softball fun for my child. I will help my child enjoy the SVGSA softball experience by doing whatever I can, such as being a respectful fan, assisting with coaching, or providing transportation. I will play for the “fun of it,” not just to please my parents or coach. I will never argue with the officials’ decisions and will let my coach ask any necessary questions. I will control my temper - no “mouthing off” or throwing equipment. I will work equally hard for myself and my team. I will be a good sport and cheer all good plays, even my opponents’. I will treat all players as I would like to be treated. I won’t interfere with, bully or take unfair advantage of any player. I will remember that the goals of the game are to have fun, improve my skills, and feel good. I won’t be a show-off or always try to make the most plays. I will cooperate with my coach, teammates, and opponents, for without them I don’t have a game. Players will uphold the standards of conduct put forth in the SVGSA Player Code of Conduct. 1. All coaches are responsible for their own personal conduct, the conduct of their players, and the conduct of their spectators. 2. Coaches will uphold the standards of conduct put forth in both the SVGSA Parent/Spectator Code of Conduct, and in the SVGSA Player Code of Conduct. Umpire has full responsibility for enforcing the Players’ Code of Conduct, the Parent/Spectator Code of Conduct, and the Coaches Code of Conduct. Misconduct could be enforced by ejection from the game/field and/or disciplinary action by the Board. 5. In the absence of any of the above-named officials, the opposing coaches may confer and reach agreement on the fitness of the field for play. 1. Each team is responsible for cleaning their side of the field after a game, including dugout and spectator areas. 2. Failure to comply may result in disciplinary action. If an umpire is not available 10 minutes after scheduled game time, the home team will supply the home plate umpire. The visiting team will have the option to provide a base umpire. Between these two volunteers, changing positions at the end of each inning can be determined. Noncompliance will result in forfeiture. 1. Games that are canceled, rained out, or needing to be rescheduled due to poor field conditions must be re-scheduled through the Director of Fields. 3. 48 hours notice of the make-up game shall be given to both teams, weather permitting. Forfeit time will be 15 minutes after scheduled game time. 1. The time limits will start with either notification by the umpire or the first warm-up pitch. 2. All games in 12U - 18U will carry a 1:50 drop dead time limit, meaning that no inning will start after 1:40 and an incompete inning at 1:50 will revert back to the last complete inning score as the final score. .
3. In 14U only - When 4 innings are completed or in the umpire’s judgment the last inning has been reached, the five run rule will be waived. In the event an SVGSA game ends in a tie, the ASA Universal Tiebreaker will be used. The home team shall be listed second on the schedule and shall occupy the third base bench or dugout for league and tournament play. 1. Each coach will be responsible for presenting the line-up sheet (with substitutions in 18U) to the umpire before game time. 2. The umpire will exchange the line-up sheets with each coach and it will then be the responsibility of the home team to keep the official score-book. 1. Each girl shall play at least three (3) total innings of offense and three (3) total innings of defense if she is on the roster. An exception will be made if the game is called by the umpire. 2. 12U and 14U: Pitching time for these divisions will be restricted to a maximum of 4 innings (one pitch constitutes an inning) per game. 3. 18U will have no pitching limits. 1. The umpire must be notified at the time of any player substitution. 2. In the event of an illegal substitution, the batter may remain in the game, but the batter will be called out. 3. Any player may be withdrawn and re-entered once, provided they occupy the same position in the batting order whenever in the line up. The original and the substitute cannot be in the line up at the same time, except in the event of an incapacitating injury. Position and delivery as per ASA fast-pitch (f.p.) rules. Not allowed in any division during regular season play or during end-of-season tournament play. If either team is ahead by 10 or more runs after the completion of 5 innings or more, the game is over. 1. A third out will be called after a team has scored no more than 5 runs in one inning. 3. 18U - There is no 5 run rule in force for this division. 1. Protests are allowed during end-of-the-season tournament play only, as per ASA rules. A cash fee of $100.00 will be given to the umpire, who will immediately stop the game and call a meeting with both coaches. 2. You may not protest a judgment call. a. Time limit will be established by the Tournament Director. b. Tie games will be played off. c. High seed will be home team and occupy the third base side. d. The 10 Run Rule will be in effect during tournament play. e. In order for a player to be eligible to play in the season end tournament, she must have played in 60% of her teams scheduled games. Special circumstances may be reviewed by the Board of Directors. 2. A completed roster of eligible players will be due prior to the beginning of tournament play. 1. Any team that is contacted by any other league or association to participate in a tournament must notify and obtain permission from the SVGSA in order to compete in that tournament. a. Approval of the SVGSA and the pick-up player’s coach must be obtained first. a. Petition must be submitted to the President for voting on at the Annual General membership Meeting in the fall. b. Any petition must include a precise statement of what the amendment is and what article, section, or subsection is to be changed. 1. The Executive Board reserves the right to amend the Bylaws as needed in order to provide a better program for the membership. 2. Executive Board Members and Executive Committee Chairperson must have seven (7) days notice prior to voting on changes in the Bylaws. 3. 7 day notice can be waived by majority vote of the Executive Board. 1. Continuous batting order involving all team members. If a girl comes late, she will be added to the bottom of the batting order. 2. Free substitutions, with every player playing defense at least 3 innings. 3. All games will consist of 7 innings. There will be a 1:50 drop dead time limit for all games. A new inning cannot start after 1:40. 4. If the game is stopped for time limit, the score reverts back to the last completed inning scores. 5. There is a 5 run limit per side per inning through the 4th inning. All innings AFTER the 4th are unlimited. 3. 10 players – the 10th player being an outfielder, but not a rover. The team may play the game with 9 players. If there is an injury or a player is taken out of the game for misconduct, you may end the game with 8 players. 4. Dropped third strike rule is waived. 6. All gmes will consist of 7 innings. There will be a 1:50 drop dead time limit for all games. A new inning cannot start after 1:40. 7. If the game is stopped for time limit, the score reverts back to the last completed inning scores. 8. There is a 5 run limit per side for the entire game. 4. Continuous batting order involving all team members. If a girl comes late, she will be added to the bottom of the batting order. 5. Free substitutions, with every player playing defense at least 3 innings. 6. Time Limits- All games will consist of 6 innings. There will be a 1:30 drop dead time limit for all games. A new inning cannot start after 1:20.
b. If the time limit expires during an inning, play is stopped immediately and the score after the last completed inning is the final score. c. The only exception is if the home team is leading and batting in the bottom of the inning. Then the game is over, and the score at that time is final. d. In the event of a tie after 6 complete innings, the official score will be recorded as a tie. 7. Pitching Machine will be used in all games. b. Each batter gets a maximum of five pitches to put the ball in play. The batter is out if after the fifth pitch the ball is not put in play. Three swings constitute a strike out and the batter will be out. c. There is no base on balls. d. Any ball landing and staying in the pitching circle or striking the machine will be a ground rule single. This will be called by the game official. All base runners will advance one base only. Fielders are not allowed inside the pitching circle at any time to make a play on the ball. If this occurs, the ball will be deemed dead and the batter will be safe at first base. e. Pitcher Position - A player is placed on the outside of the circle, assuming the defensive position of the pitcher. One foot must be touching the edge of the circle at the time of the pitch. f. Stealing will not be allowed. Base runners are not allowed to lead off. 8. Infield fly rule is waived. 9. The umpire will call time immediately when the ball is controlled in the infield by a defensive player, providing that player is not attempting to make a play. 10. The Five (5) Run Rule will be in effect in all 6 innings. 11. Four (4) coaches are allowed. 12. One (1) Parent/Coach may be in the outfield area to verbally encourage the defensive players for the first (1st) and second (2nd) game only. 13. NO RUNNERS WILL BE ALLOWED TO ADVANCE ON AN OVERTHROW TO 1ST BASE THAT ENDS UP OUT OF PLAY. All runners may advance on overthows to third base. 14. There will be no bunting. 3. 10 players - the 10th player being an outfielder. 5. An inning shall consist of 7 batters coming up each inning. Three outs per inning is waived. Once the 7th batter has completed her at bat and play has stopped the inning is over. If the defense makes an out on a batter or base runner that base runner must then exit the playing field. 6. 5 innings or a maximum of 1½ hours constitutes a complete game. a. A pitching machine will be set at approximately 35 feet. A 10 foot pitching circle will be in place around the machine. Only the offensive coach will be inside the circle, and operating the pitching machine The inning umpire will call outs at the bases and home plate. Balls and strikes will not be called. b. Each batter gets a maximum of 5 pitches to put the ball in play. The batter is out if after the fifth pitch the ball is not put in play. Balls and strikes will not be called. e. Pitcher Position - A player is placed on the outside of the circle, assuming the defensive position of the pitcher, one foot must be touching the edge of the circle. 8. Stealing will not be allowed. Base runners may lead off when the ball leaves the pitching machine, but must return to the base if the ball is not hit. 9. There will be no advancement on an overthrow. 10. The umpire will call time immediately when the ball is controlled in the infield by a defensive player, providing that player is not attempting to make a play. 11. Infield fly rule is waived. 12. The Five (5) Run Rule will be in effect all 5 innings. 13. Two parent/coach(s) may be in the outfield area to verbally encourage and assist the girls on defense. 14. Scores may be kept by teams, but no divisional standings will be kept. 15. A tie stands as a tie. 17. All girls will receive a participation award. 18. No official umpires will be provided by the league. 20. Coaches are encouraged to stop the game, after time has been called, to provide instruction and encouragement. 5. Each player will play offense and defense; with a maximum of 1½ hour play time. 6. 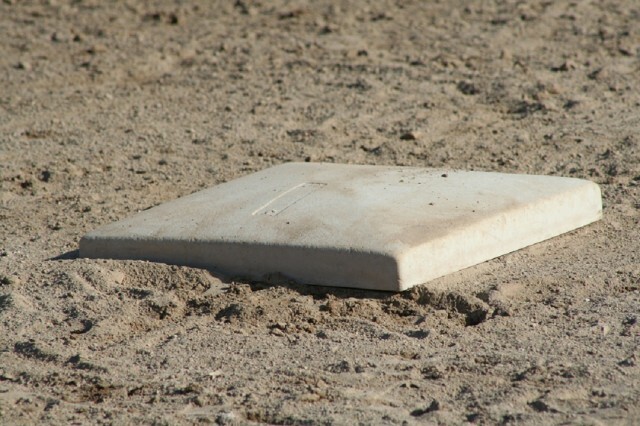 The batter will hit the ball from a stationary ‘tee’ on home plate. a. Batters must take a full swing at the ball. b. A coach/parent may assist at the tee, but may not touch the batter during her swing. 7. Runners may advance without restriction while the ball is in fair play. 8. Runners do not advance on overthrows. 9. No leading-off, stealing bases, or walks. 11. An inning shall consist of once through the batting order or three outs. 13. No more than four (4) parent/coach(s) may be on the field to verbally encourage and assist the girls. 1. Players are allowed to wear metal cleats.